Tomorrow at Power Lunches in Dalston, my friend Melanie is putting on an event with her compadres from the Art & Science MA at St Martins. 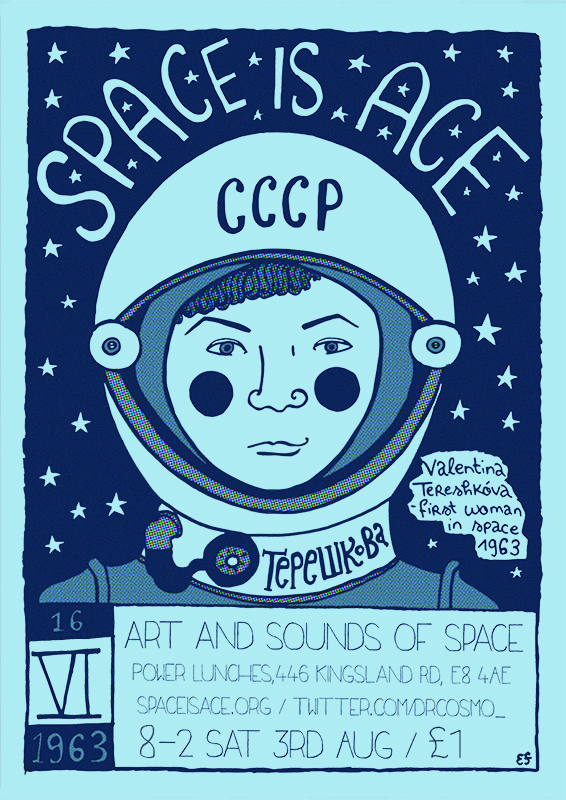 There’s going to be bands, sound art, projections, edible sugar glass planets, and a very large amount of tinfoil. I did the artwork for the flyer. If you like it, and are coming to the event, you will be able to buy A3 posters of it (a few people asked already). I don’t know the exact prices yet, because I haven’t got them printed yet, but the b&w edition will be roughly £1.50 and the colour version more. Earlier tonight we passed an unwanted broken satellite dish inbetween Kingsland Rd and London Fields. When we walked back we accidentally walked a different route and couldn’t find it, but hopefully tomorrow it will still be there. The best things are found in skips. So far in my life I have collected an early 80s keyboard, some Fall albums, a big wicker chair, unused oil paints, a drawing board already covered with a competent pencil drawing of a trumpet, a giant light box and assorted books. I’ve ended up being responsible for choosing the music to play inbetween things. I was sorting out my record collection recently, while organising to move, and I realised I have far more Stereolab 7″s than I realised. Obviously I like Stereolab, and have for a long long time, but I don’t actually remember buying all these singles, which is just strange. Anyway, expect Stereolab, Kraftwerk auf Deutsch, Boards of Canada, Neu, that stuff. OK, basically all the stuff I like anyway. Transmission out.